One of my favorite times in Oregon is the Fall. The rich earth-tone colors fill the trees and fields, making it almost like a painting. I also neglected to mention that Fall is my favorite of the seasons because of apple cider donuts, Bauman Farms apple cider donuts, to be specific. 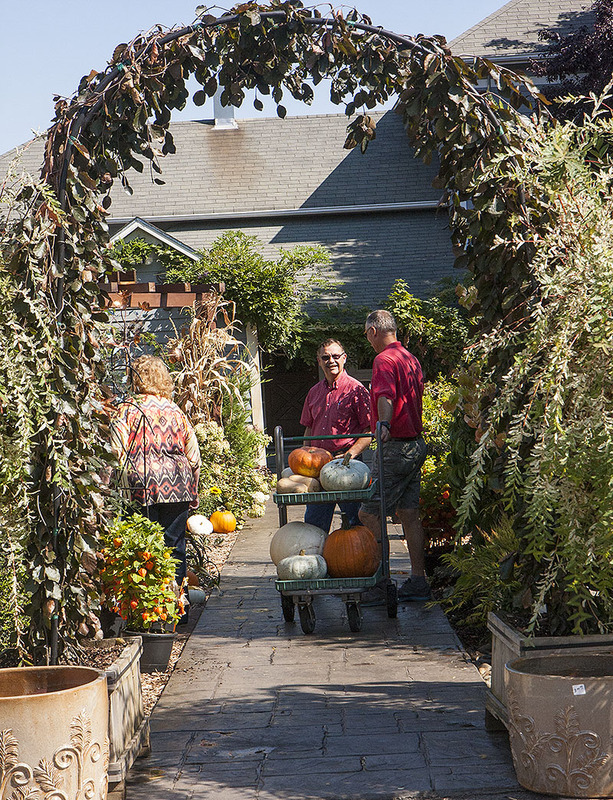 Bauman Farms, located south of Woodburn off Highway 99E is one of the pillars of agri-tourism in the Willamette Valley. This farm, which has been around since the 1800s, not only grows fresh flowers and vegetables, but also becomes a huge playground during the harvest. The year-round farm has wonderful seasonal decorations and produce throughout the year – and the aforementioned bakery to die for. But this farm really springs to life in the run-up to Halloween. Fields become homes to huge round hay bales with painted faces and other artwork, barns are transformed into huge 3-D mazes for the kids, with slides and steps in the darkness, and there is even an apple cannon and pumpkin pyramid (you have to see it to believe it). Each year the family who owns the farm comes up with something new and different. One year they had a giant rubber bladder filled with water that kids could jump on. In 2012 the new attraction was the first time they had offered a “haunted” experience. One of the key attractions during these harvest events is the demonstration of how to make apple cider. It’s an impressive operation, and after you can sample some of the cider in the store. The farm also has a special UV way of pasteurizing their cider, so they don’t have to cook it. Be warned, it’s addictive. Did I mention they use the cider in donuts too? For the more adventurous kids, there is a huge zip-line which is really fun too. Riders start at the top of a huge hay stack and zip down. Screams of excitement fill the entire farm when there is a good line of kids and their parents ready for the flight. Believe me, if you decide to visit Bauman Farms, whether you are young or old, you can spend an entire day exploring the festival-like atmosphere. The list of activities fills two pages and changes every year, keeping it fresh for locals and impressing anyone who visits for the first time. In 2012 the farm had no fewer than 25 activities during the Halloween season. The family has been farming for more than 100 years, with the current operation going since 1988. It was started as fruit stand, and has grown from there exponentially throughout the years. Today thousands of people visit the farm, year round, to enjoy not only the fresh produce but to visit the petting zoo or playground the family has built from scratch. But the real star of the show, year round, is the retail store the family has on the farm. With a bakery, produce market and seasonal decorations, it should be a stop for anyone looking to find the best in what the Willamette Valley has to offer. During the summer months the greenhouses are filled with hanging baskets that are simply amazing, bursting with colors and so thick and lush that as a home gardener, I am baffled at how they do it. We all know the racket that some pumpkin patches have. You can’t park your car, enter the farm or look at a pumpkin without it costing $50. At Bauman Farms it’s completely different. Yes, you have to pay for the really good rides, and they offer bracelets that are very affordable. But parking and admission are free, always have been. There are even some activities on the farm that are free too, like walking through the pens or the playground they have set up. So whether it’s looking for a pumpkin, hanging basket, fresh fruit and vegetables, decorations or just plain fun, Bauman Farms is family fun. About Bauman Farms: Bauman’s Farm has become a family tradition for thousands each year and all the fun begins this September 28th and runs till Halloween – before the farm is transformed once again for the Holiday Season! Though Bauman Farms is open year-around, it’s the fall festival that garners the thousands of people wanting pumpkins, pies, squash, and apple cider and of course a ton of fun all over the farm. Each year the Bauman family transforms the farm into an activity center with mazes, slides, obstacle courses and some very inventive apparatus that only a farmer can conjure and make fun for a kid (of any age). What to bring: While the retail store is indoors, and there are activities that are under cover, Bauman Farms is a farm. Farms are outside, and this farm is outside in Oregon. So if you like mud, especially if you trek into the fields or pen areas, be prepared to get a little dirty. The main walking area is kept tidy, but you are still outside so make sure you wear appropriate shoes and clothing. Tip: Donuts aren’t the only thing the bakery on-site makes, there are also fresh pies and other treats that are simply amazing. Also, if you do decide to visit the farm, the weekends in October are very busy, so trying to visit during the weekdays is the best if you want to avoid huge crowds. Having visited throughout the year, Bauman’s usually is busy but not overly so during the off season. Season: The farm is open year round. From Portland: Take I-5 South to the Woodburn Exit 271. Take a left off of the freeway and go about 2 miles to Hwy 99E. Take a right on to Hwy 99E (at the Safeway) and travel about 3 miles to Howell Prairie Road. (Bauman signs on Hwy 99E before and at Howell Prairie). Travel down Howell Prairie Road about 1/2 mile. First farm on the right.